Mercadante was prolific and famous in his lifetime (the 9th edition of the Oxford Companion to Music states that he was known as the "Italian Beethoven") but history has not been kind to him. Principally known as a composer of operas, of which there were about sixty, he tended to be overshadowed by Rossini in his youth and, after his successes of the 1840s, by Verdi. He also had to compete with Donizetti and Bellini. During his later years he went blind but still composed by dictation. At present there seem to be only about twenty discs devoted to his music that are readily available. 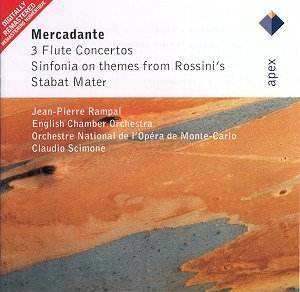 These include a few of the operas and several recordings of the three flute concertos presented here. There are versions played by James Galway and Marzio Conti � see link below to a review of the latter. The flute concertos are relatively early works and each is in conventional three movement form. I have been unable to find out for whom or why they were written. If not profound or particularly original, they are attractive and gracious, with lyricism generally winning over virtuosity. Only the E major concerto seems to slightly outlast its material. Each work has a sparkling finale, particularly the jaunty rondo of the E minor work. Jean-Pierre Rampal plays these concertos with obvious affection and without affectation. He makes a most pleasing sound and is well-supported by both orchestras under Claudio Scimone. The later Sinfonia on themes from Rossini�s Stabat Mater is a worthwhile bonus. Various themes are included and the work is cleverly built around the (once heard never forgotten) tenor aria Cuius animam gementem. There is a dramatic opening and long lead-in to the big tune which is given by the strings and returns in different guises before the rousing conclusion. The documentation is a bit scrappy, mainly consisting of a short essay on the composer which tells us little about this music. Movement headings do not seem to be trustworthy � I am fairly sure that they are switched for the first two movements of the D major concerto and was struggling to accept that the opening movement of the E major was (or should have been) played adagio maestoso. Twice the composer�s year of birth is incorrectly given as 1797. Recording details of the last two works are omitted - the copyright dates suggest they come from earlier in the 1970s. The sound quality does not vary greatly between locations and is generally well-balanced with just one or two moments of roughness. Overall, the merits of this disc are considerable and, at bargain price, I am inclined to forgive the vagaries of the documentation and give a positive recommendation.